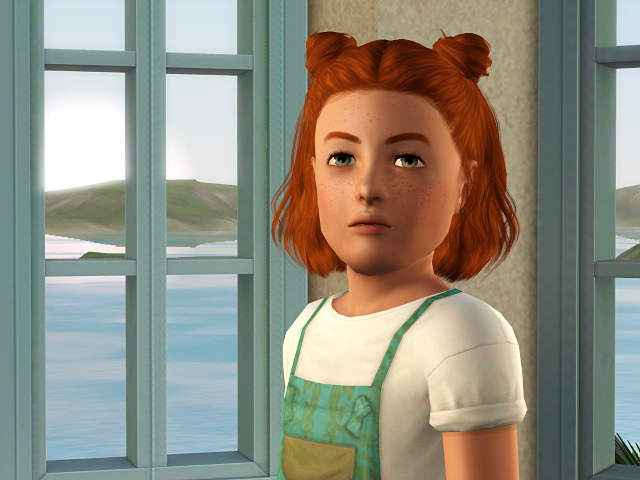 I tell ya, every time I jump back into the Sims, I end up playing this lovely lady. Her name is Kali. She's what happened when, waaaay back in vanilla game, I discovered you could befriend the Grim Reaper, talk him into moving in, and make half-Grim babies. I proceeded to charm two Grims and then breed them. 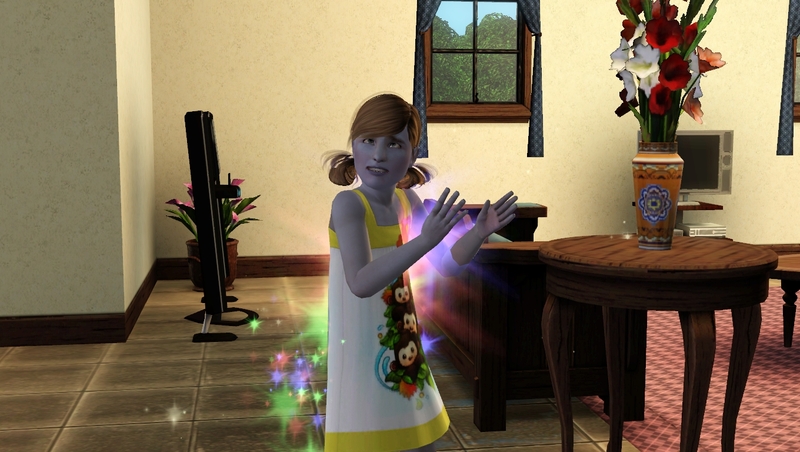 The wicked little spawn they produced immediately became my all-time favorite Sim. She's been around since 2009. So many lifetimes. So many lovers and spouses (most eventually murdered). So many children (my avatar is one of them!). So many victims. 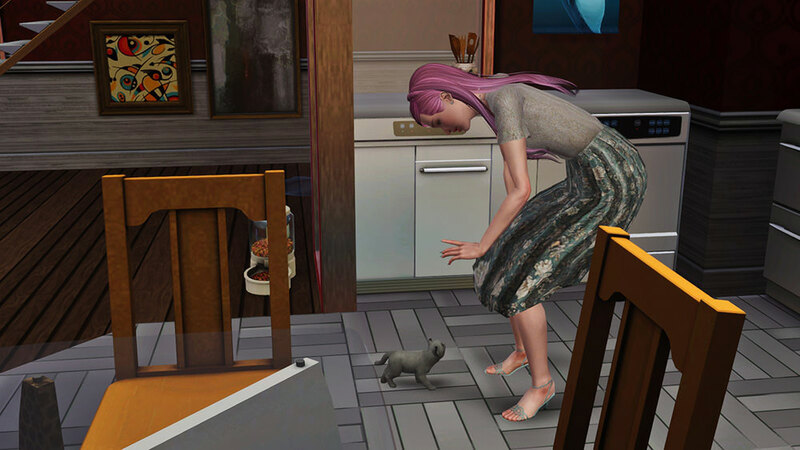 A week or so ago, I decided to take a brand-new copy of her - fresh from CAS - and drop her into Isla Paradiso as a broke, unskilled little starter sim. Something of a resurrection. 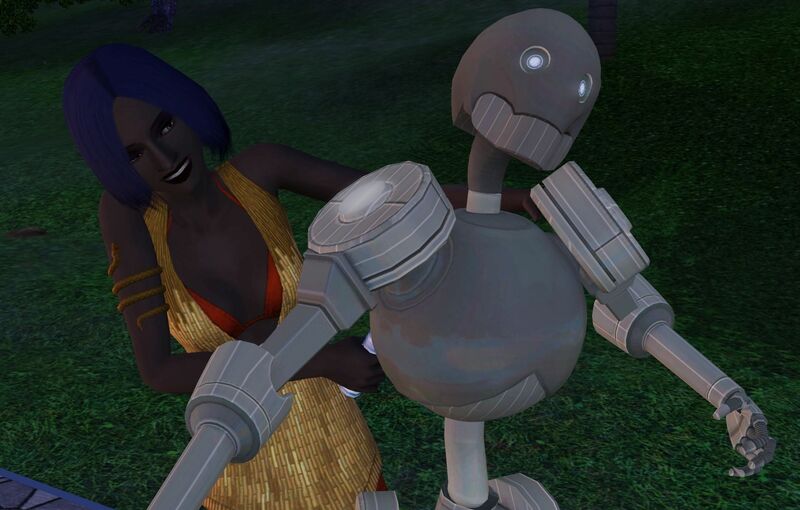 After a few sim-weeks of flailing around, too poor to do anything fun, she found a time machine, traveled to the future, and came back with a winning lottery ticket and a robotic servant because enough of that. Built herself a pretty sweet house with an infinity pool and a nice view. 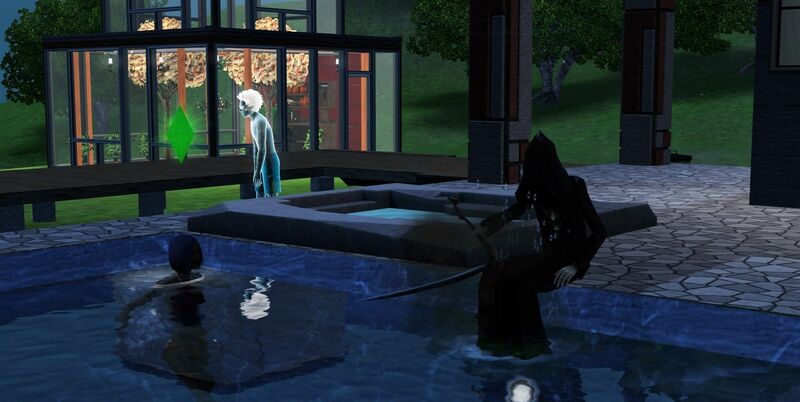 And threw a housewarming party so epic that Death himself decided to join in before taking away an unfortunate drowning victim. Cameron, single mom and adventurer (she has the Great Explorer lifetime wish). In between jobs at the moment. She maxed the firefighter career but quit that job and now is looking for something else (rolled the wish to become a writer, who knows...). Age: recently turned adult. Her son Daryl, the very unwanted result of a one night stand with Lance Lott, a selfish vagabond who has kids all around the globe. Daryl is a lonely and quiet kid. His best friend is his mysterious and creepy rag doll Pal. School is not Daryl's priority in life. In fact Cameron's deepest fear seems to come true: the boy's taking after his father. Or is he... The future will tell, since Daryl is the next heir. And his sister Jodie, daughter of Cameron's once good friend River, as it happens one of Lance's many children around the globe. Which makes Daryl and Jodie not only brother and sister, but also cousins in a way. Cameron and River were in a relationship for a short while, but seperated recently. Jodie is a sweet and perfectionist girl, though also a bit clumsy. The family lives in an apartment complex with several other people and a cat, Charlie. Charlie! Yikes! Behave yourself, people are looking! 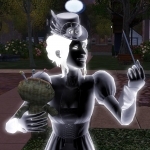 @VexingQuery I know I managed to get one of my Sims to befriend Death, but nothing ever came of it. And, @Mikezumi, I have only ever had a genie the normal period of making the three wishes. Didn't make him part of the household. Stuff to add to the very long list of future play options, I guess. 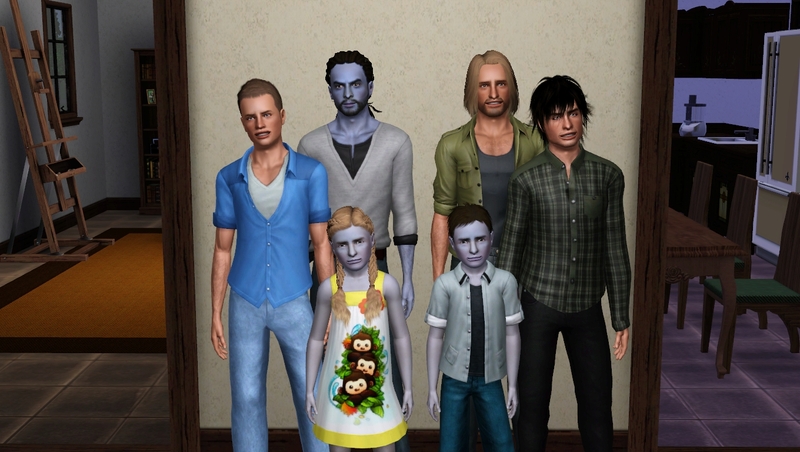 @JoAnne65 I love the look of your Sims. Frankly, I don't usually like modded Sims, but I do like yours. Not that I'm going to implement any facial mods myself. I'm content with the game's controls. At least, so far. After all, I'm still only play my second generation, and all but one of them was adopted. So I haven't hit the "pudding face" level yet. We'll see how I feel in a couple generations. @Jude525 Thanks I’ve played CC/modless for years and loved my sims also back then (actually I prefer my previous sims the way they looked vanilla, probably because that’s how I know them and played them). The skin I use now fits the Maxis Match description. That’s important to me. As long as you mix sims you like (and test ‘combinations’ - offspring of two sims - in CAS first), they won’t become puddingfaces, because they’ll always inherit the features you created and if you’re lucky mix (if you’re not lucky you’ll get clones). I can highly recommend adding a genie to your family, they are great! @Jude525 Honestly these days, the only reason to get a Grim in the house is for the entertainment value of watching the manifestation of Death burn waffles. He's not a proper Occult state, no special powers or hidden traits. But it was a novel thing to do back in the pre-WA days! ... And can you even do it anymore without mods/cheats? I've heard things about EA removing the "Ask to Move In" interaction, because if your game doesn't get around to generating a new Grim after you adopt the existing one, you will have Bad Times next time a sim dies. I haven't tried in a long, long time. Also, as it turns out, that glossy jet-black skin he passes on to his children is just a total lack of genetics. It's the game going "Wait, I did not plan for this!" It's a skinless sim! He also passes on the dreaded Pudding Face. Kali got a complete CAS makeover years ago. But I still love her dearly and always will, because her traits and LTW are perfect for my preferred playstyle. I’ll post pictures later. I’m on my phone. But I’m having so much fun with my new household andalso coming across things I’ve never seen before. 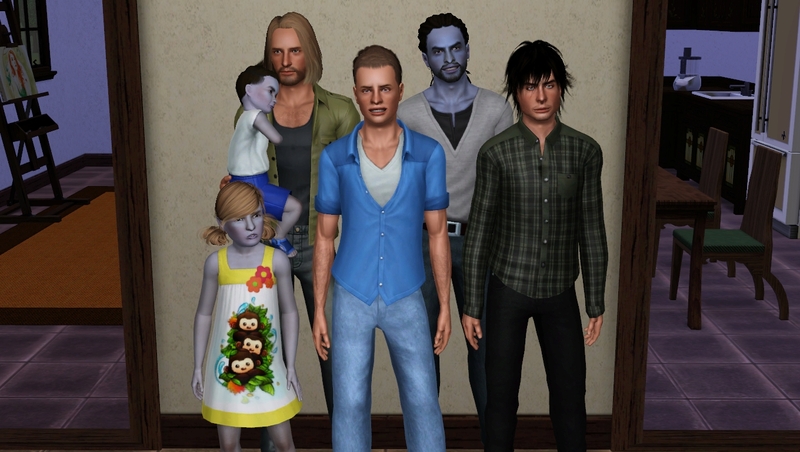 I usually play single sims and marry them and never age them up bc I get very attached to certain sims but as I was playing this one, I decided to do a full family/legacy style. I recently started a new household and made it an early 1900s country home and added a barn. I had my sim, Danica move in. & then she also adopted two cats over time and eventually a horse. As I was throwing a birthday for their second child, Hayden, the whole house caught on fire after the cake candle was lit so I missed him aging up. =( but then Chauncey aged up too and his life basically went downhill lol. So I wanted this to b a “normal” household but I can never keep those promises to myself with the sims lol. Chauncey aged up and had a midlife crisis & Danica wants to become a vampire. The children are aging up nicely and the pets are still doing great! im decided whether I want her to become a vampire later in life as she’s still a young adult & whether I want Chauncey to keep fulfilling any of his midlife crisis wants. lol this a real fun play!! By the way: Even tho I switch between sims games over time and go thru phases, I forgot how much family play and interaction the sims 3 has. I usually had my sims going clubbing and partying lol. Its so much fun going back after about a year of playing and diving into a new game that’s different than what I usually do. These two. I don't usually play single sim households, but this family is like therapy <:) I feel so cuddly when playing them. Grisby... To play with genetics and fulfill my dream to play all the premade families at least once (lol). I’d love to see pictures of your Grisby offspring! @Hejix Wait, did I read that correctly? If you cheat death, you have the power to resurrect others? @HeyHeyy I don't know how much you've followed here, but I was a chronic "start a new family every other month" player for years. 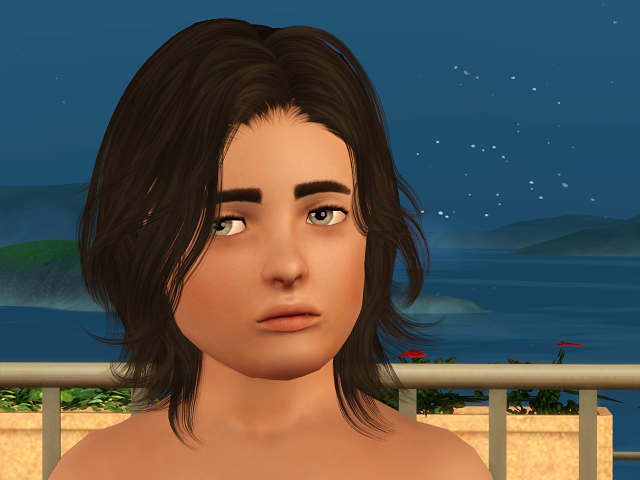 And now, partly due to the fun I have on this thread, I am on the second child in my legacy family and loving it. I'm playing it a little differently than most, starting each child back at the point where they moved out, instead of just jumping households. But the oldest was an alien abduction child, which opened some doors. And I used potions for their son to be a ghost child. More doors. Now I'm playing a second daughter in an almost all animal household and have been amazed with the aspects of the game I've discovered the past two months as a result. My point... yes, the game still holds so much wonder for me. I own several packs of Sims 4, but totally gave up on it last spring. I'm having too much fun with 3. @Sunnyyesjams That is one of the cutest caps I've ever seen! My current household in the sims 3 is actually a challenge, to be specific it is the amazon challenge. My founder/queen person is called Victorie Everdeen. She is a fairy and her best friend is Morgana Wolff. Who has become my scholar after I made her divorce her husband, who is now a Vampire. I am trying to get her become a witch and slowly am increasing her alchemy skill. 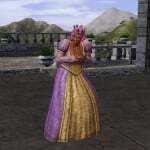 My provider is Zelda Mae, who I moved in after creating the castle, but I have not moved their household in yet. I like to build it overtime. Victorie has two girls, who are children right now, they are twins and I have forgotten the second twins name, but I named the first one Victoria, I think. When I have the chance to go back to the game and play it again I will and I will take pictures, because they are all sooo pretty! 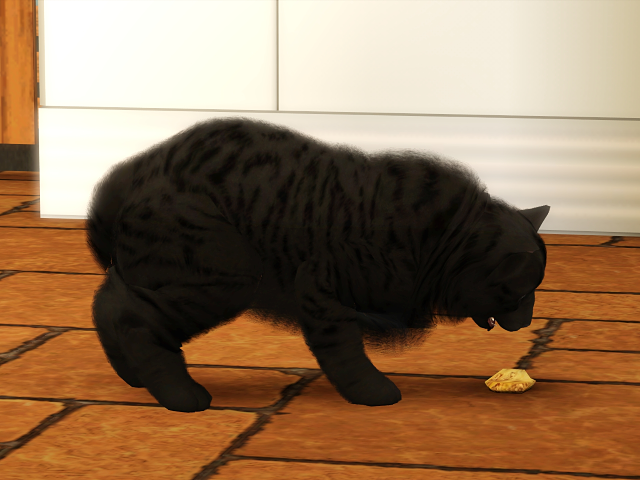 On that note, a little tip: if your sim knows how to make Ambrosia, do not starve them to death. And if you do starve them to death, do not keep their tombstone on the lot and death fish and life fruit in the fridge. I made these mistakes, and the next night my clever little minx popped out of her grave and promptly resurrected herself. It ruined my plans. But her ambition was admirable, so I let her live. Oh my goat! That is hysterical!!!! Again, hysterical!!! Who'da thunk? This game just keeps on giving. I cannot post images at the moment however I would love to share my current household. 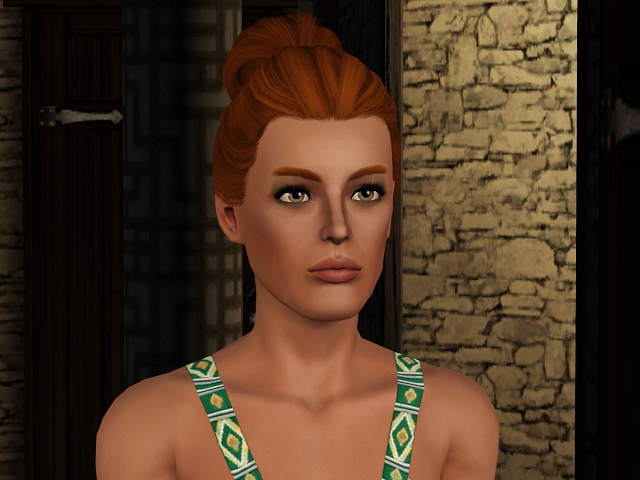 currently there are two sims: Amberle Khanarah and Matthew Hamming. I started with Amberle who is a vampire. Her backstory is that she was the only vampire in her family and moved to Bridgeport because, after being mistreated and discriminated against her whole life, she wanted to become a famous actor to get back at the bullies! Anyway, she met Matthew, a pre-made 5 star celebrity who captured her heart straight away. After becoming his romantic interest, she turned him into a vampire. After being sired to Amberle after becoming a vampire, Matthew married Amberle and they are now starting a family together. If you'd like to see my sims, please tell me and as soon as I become a member I will! We would love to! The "Off Topic" forum has a bunch of lighthearted, fast-moving posts where you can fairly get your count up. Member won't take long! My sims name is Amberle Kannarah. 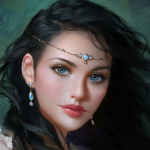 She is a vampire who currently resides in Bridgeport and is a diva who dreams of becoming a superstar actress. My profile picture is my favourite image of her. Unfortunately, my previous save file where she married Matthew Hamming got corrupted so I had to start again with her. I'm playing the Grisby in Riverview. They're such a cute couple. I go all awwwwww, when I play them. I find their noses and ears endearing. 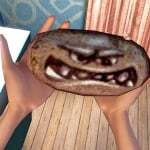 @Hejix I love your siggy "Played Sims 1 when I was a teen... Still playing Sims..."